Someone I know enjoys receiving anything that I have tatted, and furthermore keeps on at me to start tatting classes, but I have never been able to get around to organising any, even though she is not the only one to request such a thing! Anyway she really wanted a pink butterfly for her daughter. I looked for a suitable pattern but could not find one that would fit nicely into a frame. Jane then suggested one of her patterns, however, she thought before I tried it that it would need a "make-over" which she duly did and you can see it on her blog here. She also asked me, along with others, to test tat it. Now I have to say that I am so used to her patterns and just following them without any trouble, so the thought that there could be an error, really, really frightened me. What would happen if I found it? Would it mean me having to write something on her pattern? How could I possibly tell her that I had found an error? Goodness me what a responsibility. Well I have test tatted this little beauty, and here it is, not telling you if there were any errors in the pattern though!!! These little beauties will be posted to Jane in the next day or so, and for the first time ever I am really reluctant to see them go. I'm in the garage has really excelled himself this time and the shape and finish of them is even better than before. From left to right they are Mahonia, Ebony and Purple Heart. There are only two Mahonia shuttles in this batch and there is a very limited supply of this wood because most of the pieces we were given decided to split. There are 14 shuttles in total and a choice of other woods are also in this batch. Because we have purchased the crochet hooks, instead of making them, the price of the shuttles has risen to reflect this extra expense. So please go over to Jane's Etsy shop when she has opened it again and look for them, don't worry she will give you plenty of warning! I still have not worn the hat, mainly because I was not really happy about the band I put round it, it was a bit bright and conspicuous! Pure laziness really for doing it as I did not want to make one, but forced myself in the end and think it looks much better. Now I really must wear it! Hopefully I will be able to show you some finished shuttles in the next post. Hopefully I have found a supplier in the UK who has the right size crochet hooks and can keep up with bulk orders for them. I have purchased 50 so far, some of them will be going into the next batch of pop-a-bobbin shuttles. A family bereavement has meant that production has slowed down, but these should be ready soon. I thought the bits of discarded wood on the floor looked so colourful! Last Tuesday we were at Jane's home, the same day she arrived back from the USA, unfortunately the door bell had ceased to work and so I had to shout through the letter box! I took a picture of her unpacking. It was great fun seeing what she had brought back. to seeing them attached to the shuttles. I purchased this hat to wear in the sun, and fortunately the sun has just appeared over the last few days here in the UK. I did not like the original trim on the hat but really was pushed for time to make a new one. So I recycled the pew ends by sewing the button flowers on the ribbon at a different angle. Not entirely happy with the result, may be it is a bit too bright? 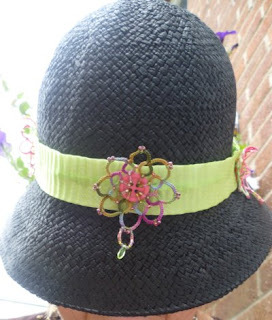 Also not sure that it suits the hat so did not go mad and put all the button flowers around it, instead spaced them out. 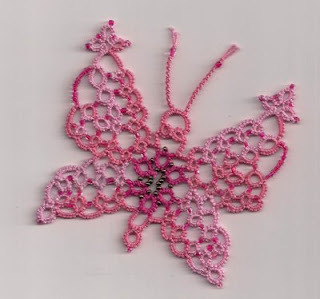 I will look out for a suitable tatted pattern to work as a trim and may be finish it in time for next Summer. This is what the hat looked like before, not very exciting. Jane is back today and I might get a peep into her suitcase to see what she has purchased whilst she has been over the pond. The title for this post came from a very old song sung by Stanley Holloway actually there is a kind of resemblance, I mean the hat not the person!